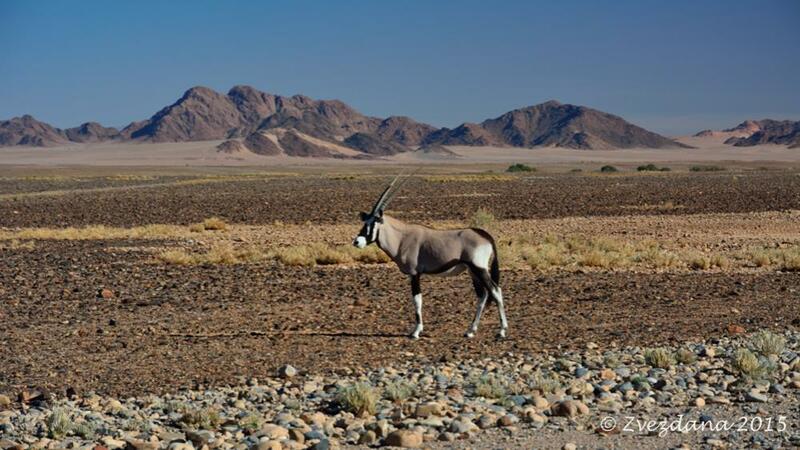 Our first trip to »black Africa, to Namibia in 2014, impressed us deeply, and as written in our previous TR (http://tinyurl.com/q9u7lrm ) we have made plans to return already while flying from Windhoek to Johannesburg, on our way back home. 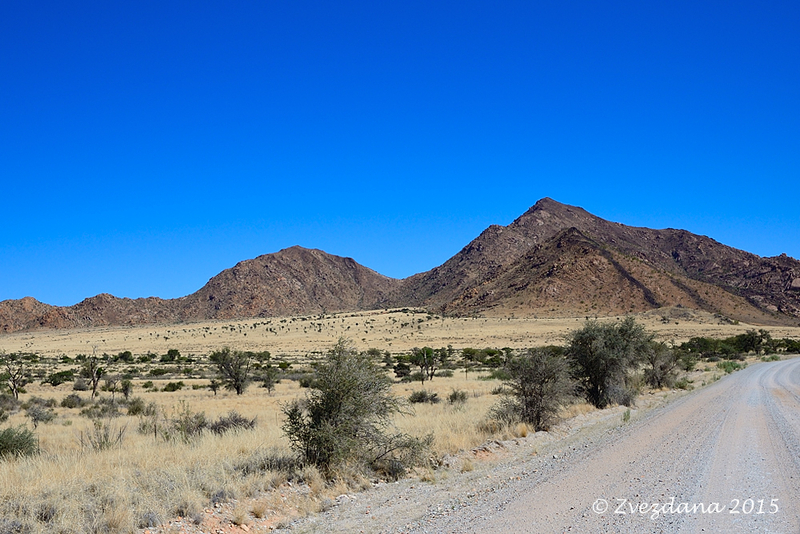 Making of the itinerary was easy enough; returning to Namibia, to see and experience/explore the other part of it, south. 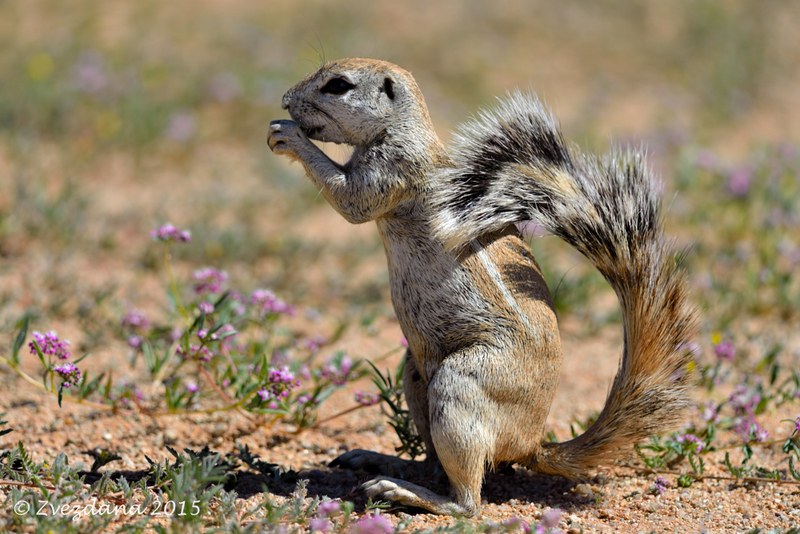 To add the wildlife component, Kgalagadi Transfrontier Park was also an obvious choice, specially after reading so many great TR here. 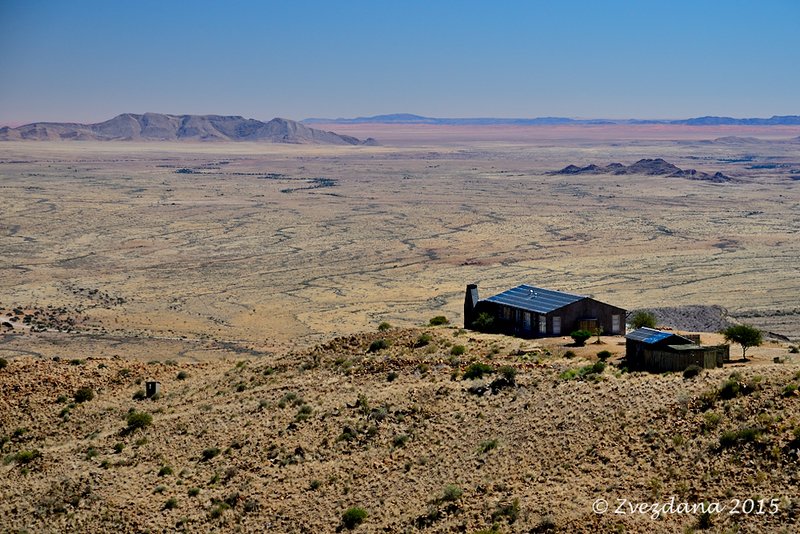 All bookings were made by Discover Namibia, mrs.Gemma Dry again did her job perfectly. 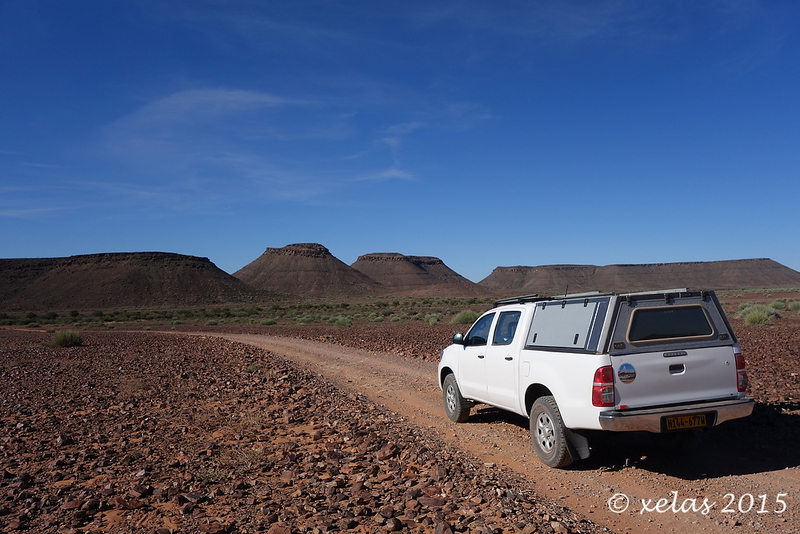 The rental car company and the car itself were the same as last year; a Toyota Hilux Double Cab with 2 spare tires and Engel fridge, from Advanced Car Hire. As we have had some unpleasant experiences flying last year with Qatar Airways, we have decided to use South African Airways for this trip. There were some more affordable options, both pricewise and logistically, yet none of those other airlines allowed us to book the complete trip, to Windhoek. With SAA this was possible. The »price« we paid for that was a 5-hour car drive from Ljubljana to Munich. That should be a pleasant drive through Austrian mountains ... if not for the heavy rain. The flight itself was OK, and on time. Nikon D610 & D7100 bodies, AF-S 20mm f/1.8 ultrawide lens, AF-S 16-85VR DX zoom, AF-S 70-200mm f/4 zoom and AF-S 300mm f/4D telephoto lens, with TC1.4 attached. Sony RX100II for my pleasure, interiors and videos. A tripod and a bean bag. With enough SD cards to last for 10.000+ RAW images (9100 was the end result, splitted D610 – 3300, D7100 – 4800, RX100 – 1000). During our 14 days/15 nights trip we have covered 3150 km, and consumed 270 l of diesel fuel. Majority on gravel roads, and we have absorbed also our first proper 4x4 sand trail drive, without problems. 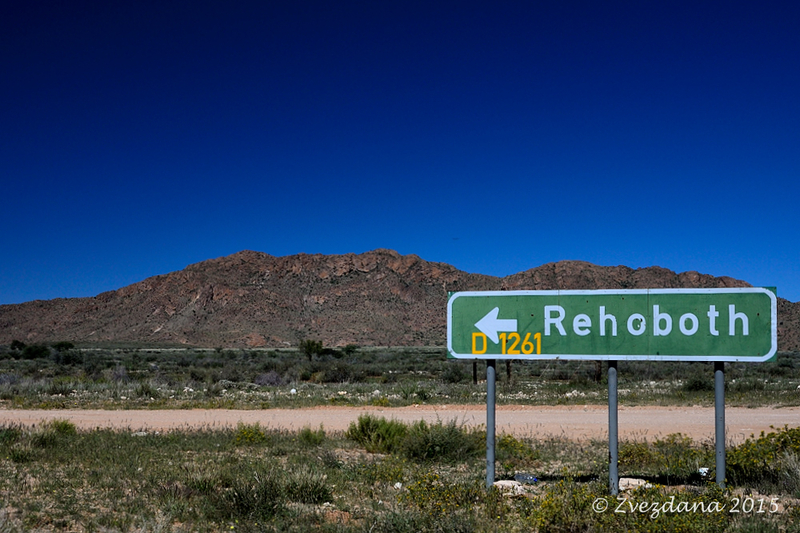 No tyre, windscreen, or other part of the vehicle was damaged during the making of this road trip. You did your big trip! 900 shots to spare by my count. . Seems no problems once you got out of Austria. That's wonderful. Welcome back. This is a first-class trip report prologue! You've laid out the relevant information in an easy-to-read style which I greatly appreciate. The trip calendar is a model of clarity. Your photography information is comprehensive, which is an especially nice section. The self-drive information tends to encourage one that such an undertaking is eminently do-able. 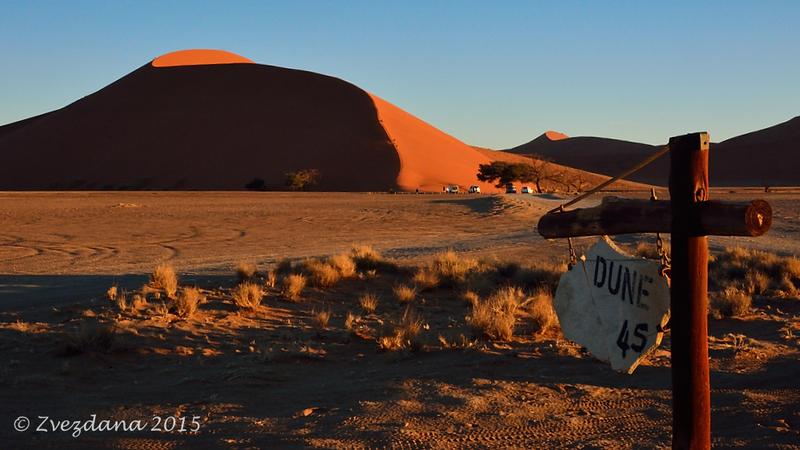 A special thanks for your helpful mention of Mrs. Dry at Discover Namibia. 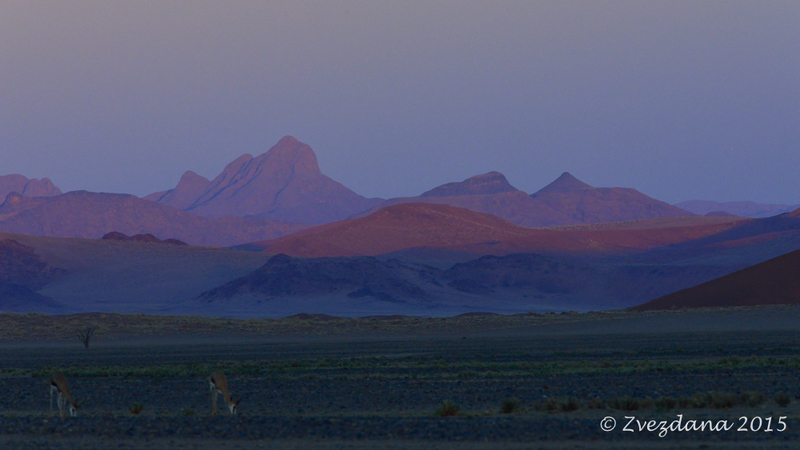 Ever since reading the trip report by @@JohnR, I've been interested in Namibian wildlife. It sounds like a fine safari. Thank you for preparing us for the trip report and images to follow with such an exemplary Prologue! BTW: I'm grateful for your support and interest in my trip report. @ Atravelynn: driving to and from Munich airport, was the toughest part of our trip. @@JohnR, @Treepol: thanks for finding my TR, and for having time to follow it. The photos will come! With such a top-class trip report Prologue, it's certain that what you write will be superb. Your very kind praise is far, far too kind. Thank you. It truly is I who have cause to be impressed by you, as you have such a fine sense of how best to clearly organize information. I'll be delighted to encourage, as your trip report is revealed, post by post, image by image. I always look forward to Namibian reports. Looking forward to your report - I have very much enjoyed your previous work! 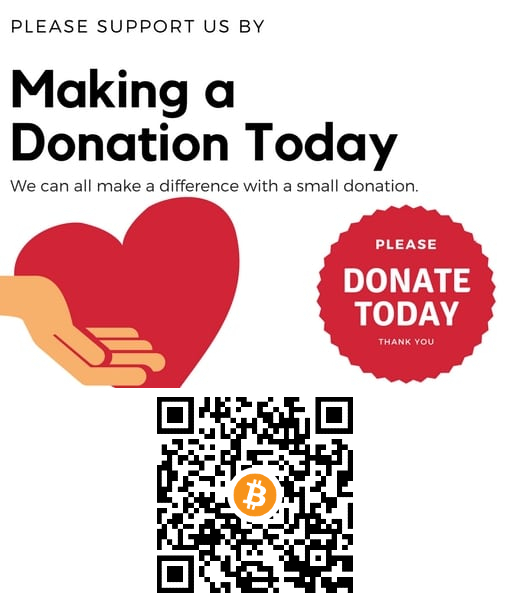 @TonyQ: thank you so much; just keep your going on, please! I pretend to have good memory for orientation (and lousy one for names) and thus, after I was sure we are not on our way to Villa Violet, I have asked the driver »Are we not going to the lodge?« »No, we are going to pick the car.« Hmmm, not sure about this, so we rechecked with Advanced. Yes, first the car then the lodge. 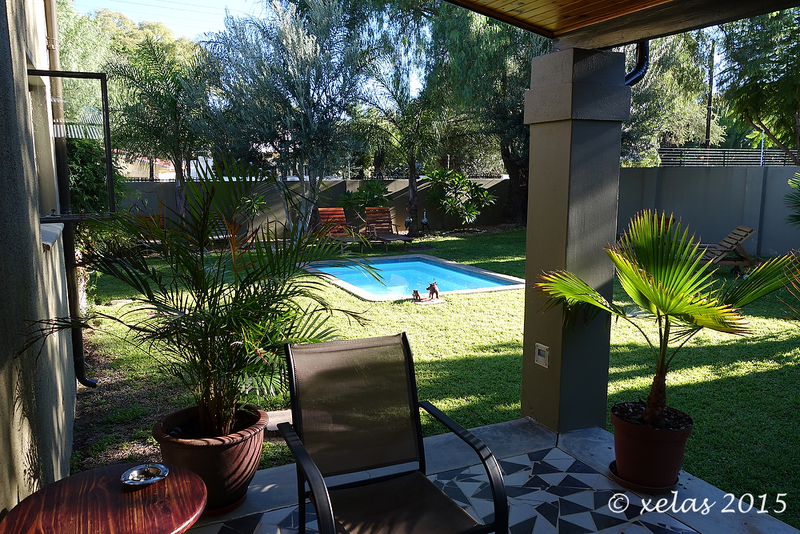 OK, we are still early (we have had an afternoon tour of Windhoek tentatively booked). At the car depot, some known faces (Marlette) and some new faces (Marchel) were awaiting us. The pick up procedure was as long and precise as last year, yet knowing the drill it was a bit faster. About 2 hours and 2 coffees later I have done the last walk-around. And have noticed that the tires on the car were not up to my standards (i.e. new to brand new condition). Marchel was eager to swap them; just it will take some time. And indeed it took him next 2 hours (and 2 more coffees for us) to collect the best looking 4 tires that were available at the workshop ... because all four were mounted on different cars!! As we were in no hurry after cancelling the Windhoek tour, I was even willing to help him with this job; I was flatly refused!! Not that I have protested too much. And what if the immigration officer would pass by, and saw me with greasy hands working on the car?! Inside the office, we have collected as much info from Marlette as we could, and with Marlette, it is not difficult to start a long conversation. We have covered so many different areas of daily life in Namibia, we found her to be an extremely nice and talkative person. When everything was up to my standards, Marchel was kind enough to lead the way, first to the nearby Shell gas station, where we have filled our »camel« (2 tanks total capacity 145 litres) and then to Villa Violet. This photo was taken a few days later; our "camel" on the road to Fish Tiver Lodge. It illustrates why I have been such a PITA regarding the tires condition. A warm welcome from Heidi, a beautiful cool room, and after the long drive (Ljubljana to Munich 6 hours, half of it in the rain) and a long flight, we were unanimously voting to skip the Joe's dinner, and instead we have crashed in the beds. 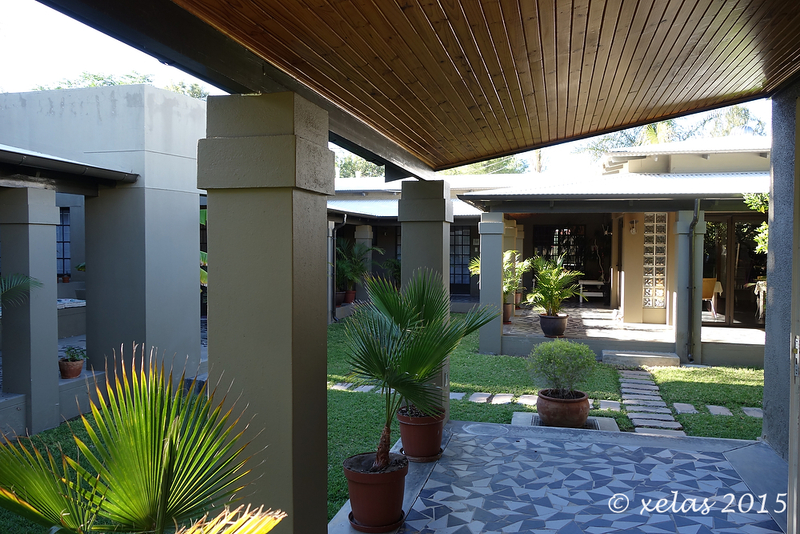 Following two photos represents the Villa Violet b&b main characteristics: clean and modern design with a bit of a zen the African way. 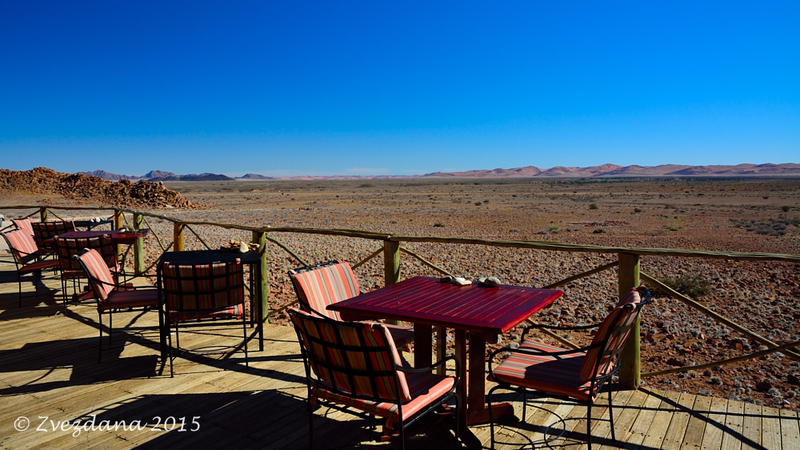 Since driving the paved roads in Namibia is not why we came there, a C26 was an obvious choice to reach Barchan Dune Retreat. Yet first we have had to reach C26; as this was our first driving inside the city itself, I was a bit nervous. For no reason. My wife has a new app on her iPad, and she was following our driving on it, making sure I will not miss the right turns. They were not many: from Ziegler Street to Nelson Mandela Avenue, then left on Sam Nuyoma and next right on Mandume Ndemufayo Avenue which becomes C26 at the outskirt of Windhoek. Once on it, we have been on the known territory. Even the police check-point was where we expected to be. A smile and a wave and we were finally starting the real deal: the road trip. C26, although a gravel road, was in excellent condition. Only the wildlife this year was very slow; only one sigting worth of photo. 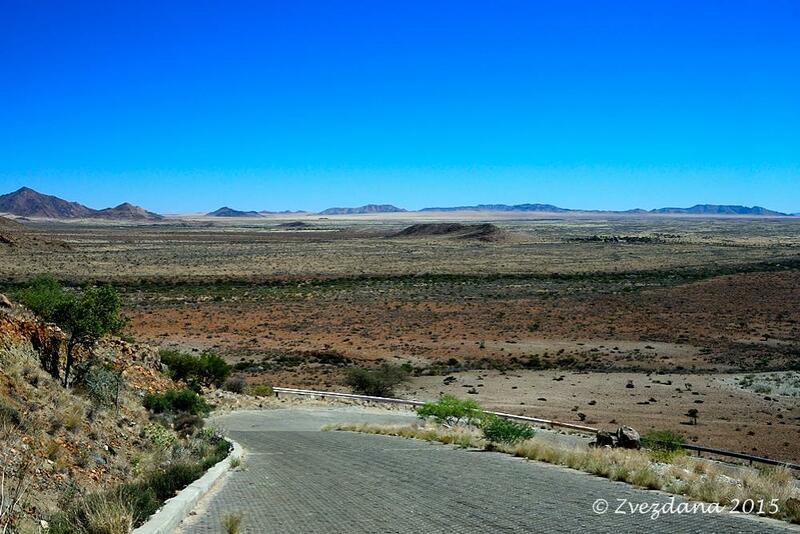 The pass to be conquered was Spreetshoogte Pass. 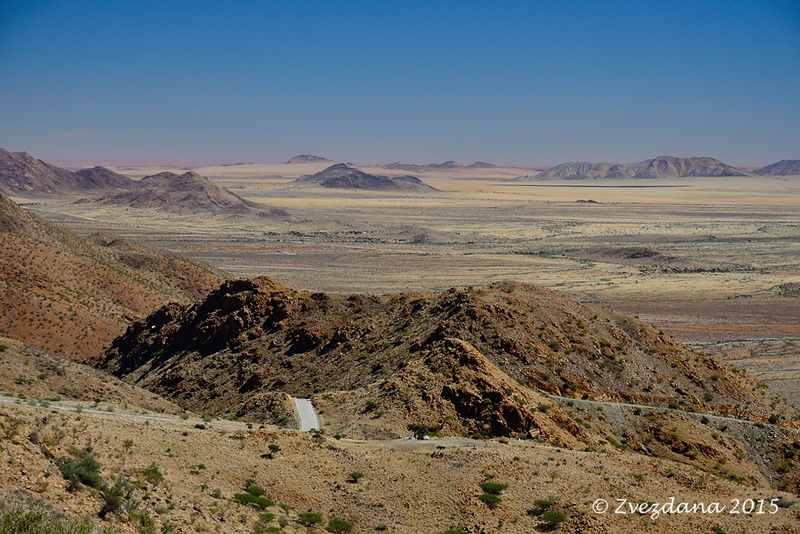 Have to say that the drive itself up and down the pass was less scenic then the Gamsberg Pass we did last year, yet the views from the pass itself more. As we have arrived early, we have had plenty of time to enjoy the views from the top of the pass itself. There is an ample parking place with a single concrete table with benches. The road that passes by the BDR is D2751; it follows the valley between Witberg on the right and Rantberge on the left. 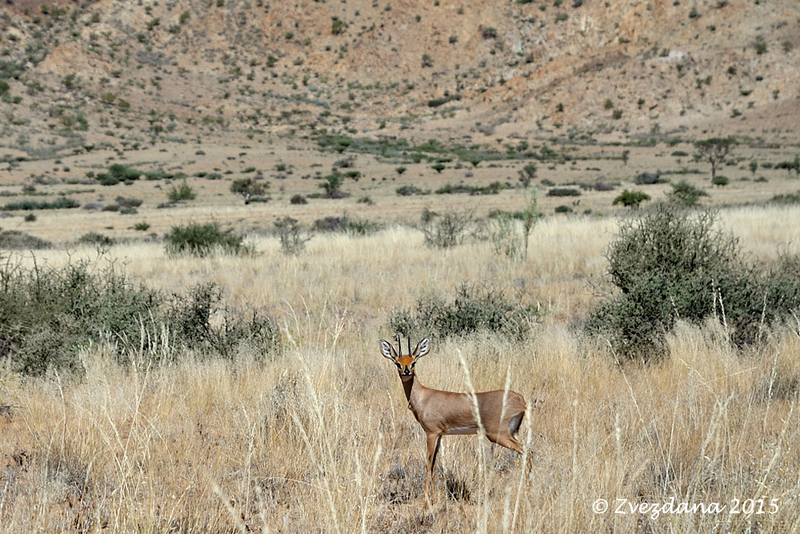 A young steenbok was spotted along the approach road to the lodge. while the one from the balcony in front of our room is even better. There are six rooms and one self catering cottage scattered around the property; we have decided to ask for upper room in Okanti House, following the (excellent) advice by TripAdvisor fellow member supratik. The room itself is huge, and the bed rated as the most comfortable we have had on this trip. The bathroom has an interesting shower, and there is a living room which is shared with other guests that are staying in this house. 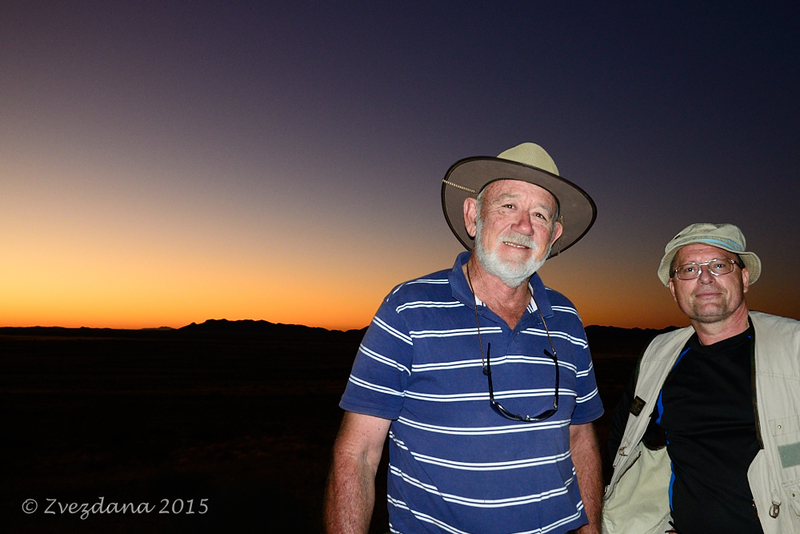 Then it was already time for our first sundowner drive, with Willem. We were the only guests so we have had both Willem, his Landrover County and the cooler completely for ourselves. 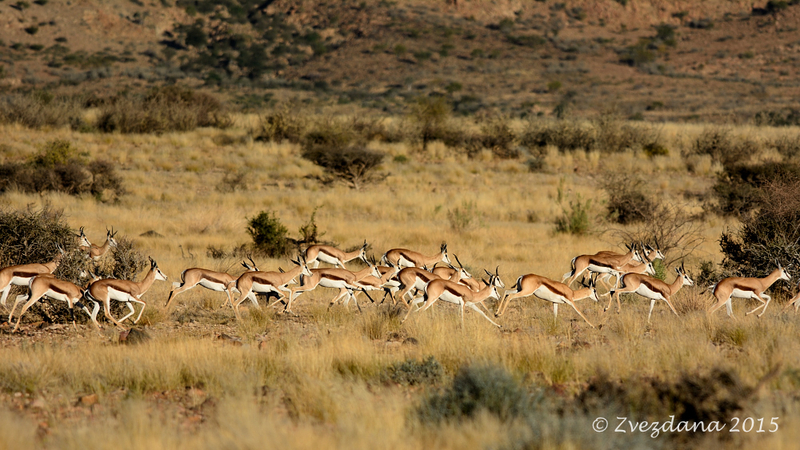 Barchan Dune is a huge farm where game is now dominating, mostly gemsboks and springboks. They have sold out cattle and are now working with game exclusively. BDR does not offer game hunting for guests. The ranch itself is an enormeus one, for our Slovenian standards. It is a medium size in Nambian standards. 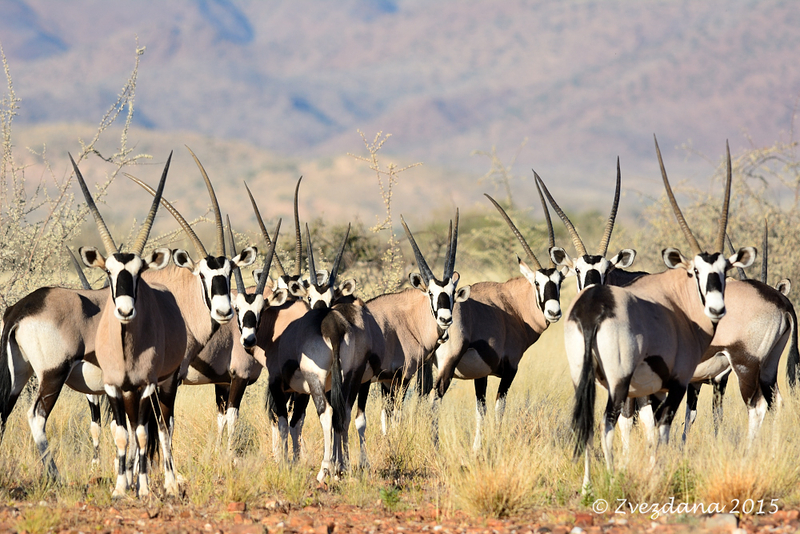 Willem told us the approximate number of gemsboks and springboks that he »owes« yet I have forgot to put the number down. Or was it to fault too much gin in my tonic?! So better let photos talk. Why do they look so happy and relaxed?? Back at the lodge it was time for the dinner. All guests sits along the communal long table; my preferred way to have dinners (or lunches). I think they were 8 or 10 adults, all from Germany. Next to me a couple was seated; there was a husband, and next to him his wife. We exchanged a couple of usual pleasanteries when I started to ask him some targeted questions. And surely enough, it was the couple I have met, for about 30 min, at the natural water spring at Ameib Ranch, in May 2014!! 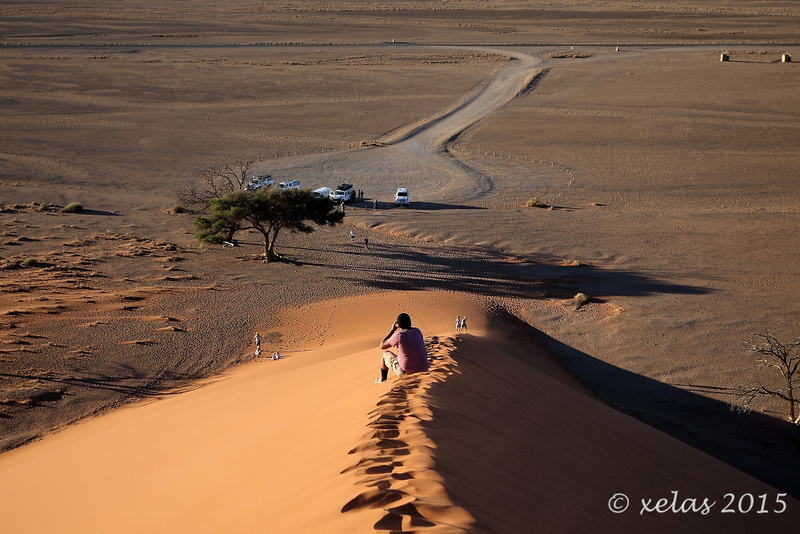 Now, what are the chances of meeting the same person, in Namibia, already the very next trip?? (find this in post #7 of our TR, link above). Back to the dinner. The food was the best on our trip, excellent IMHO. Willem has an extensive knowledge about whiskies, and he was more than happy to share it with us (but not the whiskies itself). Yet there was plenty of excellent South African wine to make everyone happy. A beautiful beginning, @@xelas, as I have never been so I will ride along with you. 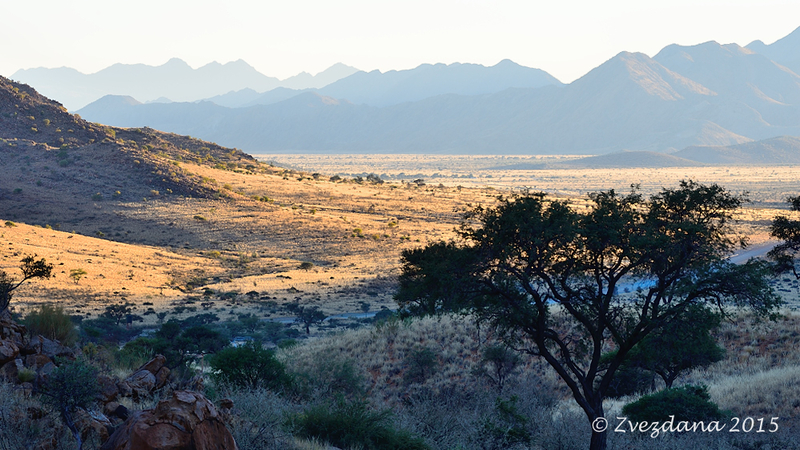 The landscapes remind me of our SW deserts- maybe a bit greener; and of course African Wildlife - very important addition. Love your sense of humor through the lines and waiting! A must if in Africa. Your Milky Way turned out good enough to eat. 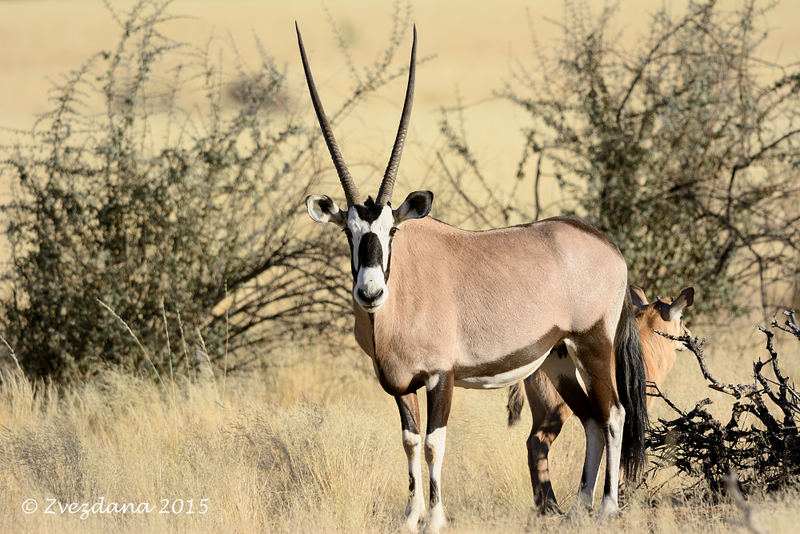 A beautiful start to your trip and a beautiful young gemsbok! We stayed at Kuangukuangu cabin in 2007. Glad to see a photo of Willem. He looks like he hasn't aged at all! Hope he and Hannetjie are both doing well. We thought their dinners were the best food we ate in Namibia as well. We were supposed to do some self catering but between the food and their wonderful hospitality ended up having all of our meals with them. Speaking of coincidences, during our stay at Erongo Wilderness Lodge on the same trip, someone approached us and asked if we had been in the Mara in 2005. Turns out we had all stayed at Kicheche Mara Camp then. We have had this happen on other trips outside of Africa as well, small world. @ graceland: what an honour for us that an Order of the Pith member is showing interest in our trip report! 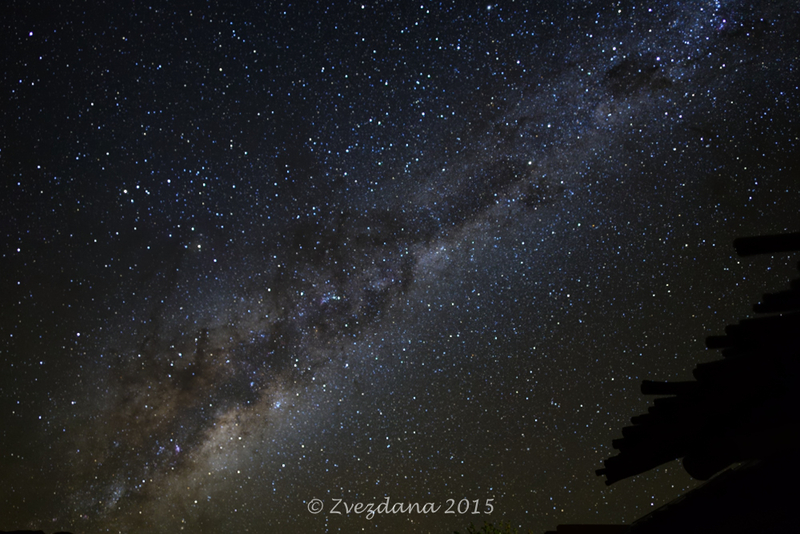 The Milky Way ... up close an personal (i.e. pixel peeping) it has a mushy taste . It was 1999, our first overseas trip. Me, my wife and our daughter decided to visit Malaysia. So there we were strolling the streets of Penang, and passing by Masjid Kapitan Keling, when an older man came out and greet us, asking from where we are. (there are two stories here, so pay attention). We replied Slovenia, and as Slovenia was a very new country, only 5 years old, almost none before knew for it. But they all smile and tilt their had and ... so I got that same reaction from the nice man and I was a bit annoyed (and it was hot and humid and architecture is not my thing) and thus I have challenged the nice man to prove if he really knows where Slovenia is. So he smiled even broader, and says "Dobrodošli!" which is "Welcome!" in our language. My jaw must have been dropped down to my knees so nice man quickly showed me the sign on a nearby building. "Jugolinija" was the biggest shipping company in former Yugoslavia, and the man has to work on its ships for years!! Now, back to the starting story. He invited me in the mosque which I politely declined (as the ladies would need to wait for me on the street), we have exchanged some more words, and when the nice man saw my wife is carrying a camera, he asked if we could make a photo together, and sent him a photo. We did the photo part, but never sent him a photo. Now, 12 months fast forward. We repeated the Malaysia trip in 2000 (adding Borneo), and we were again strolling the street of Penang, and we were passing that mosque and ... out of the courtyard run the nice man (I did not recognise him at first) waving his hands and asking us: "Where are my photos, my friend?!" And this time, also because I felt embarrassed that we never sent him his photo, I was obliged to get into the mosque, and it was a nice place indeed. So, since the world is a small place, the lesson I learned was: never promise anyone to send him a photo!! I can tell I will enjoy this report quite a bit, and I have a feeling there will be many more pith wearing St members coming along for the ride. Your tire kicking paid off...Good for you! @@xelas Really enjoyed your report last summer. Maybe it could be a June tradition? You are off to a good start already. The coincidences of running into the same people are fun to read. 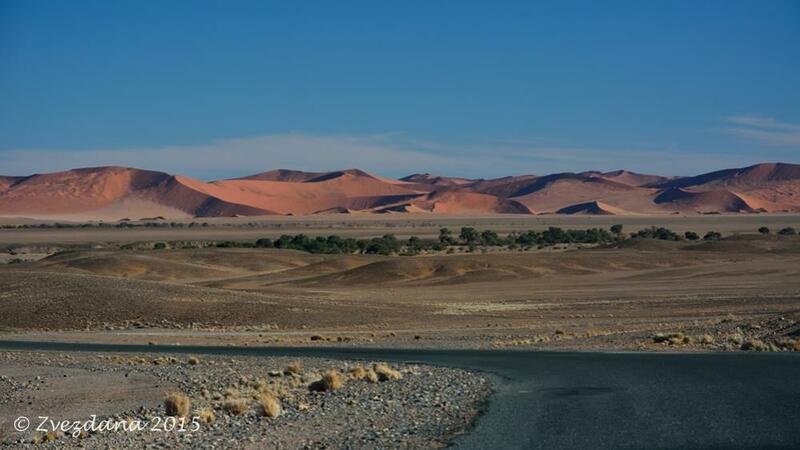 @@xelas great start to your 2015 TR, I will be avidly following your second Namibian safari. Did you see the meerkats at Barchan Dunes Retreat? I remember these from the TR that @@Patty wrote after her 2007 trip. @ Graceland: the self driving is integral part of our travels, to the point that we visits only those countries where we can drive around by ourselves (at least part of the time). 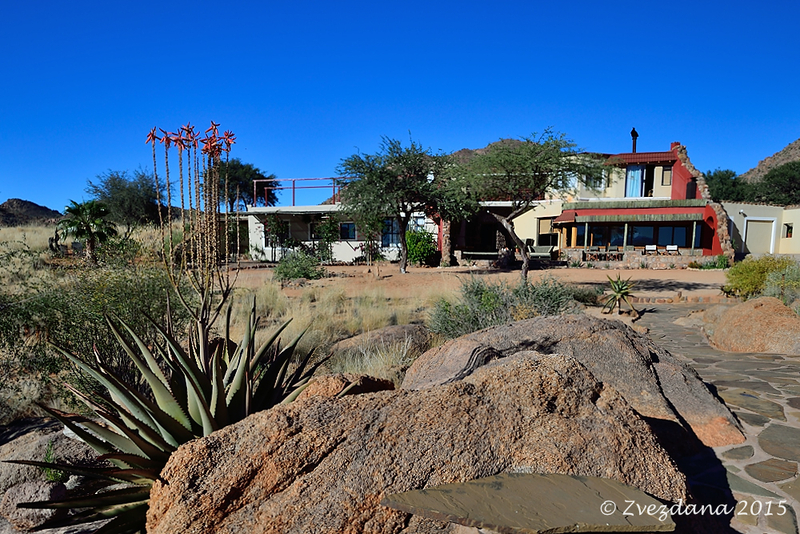 Self catering is another story all together; I am a basic food cook (you will read more about it in Kgalagadi part of the TR), and Zvezda does not like to cook when travelling. So we usually have breakfasts where we stay, and eat once a day, local type of restaurants, or food courts. I will need to get some cooking lessons for our next Africa trip !! @ Marks: thanks for kind words; we needed some time to organise the photos; the textual part is easy, I have it in my head all the time . Not possible a June tradition, next year it will be in March. But I can always post some other travel's trip reports, this and other Junes! Maybe the promised Panama one?! @ Treepol: SPOILER ALERT yes we did. Wait till this evening (local time). The day that we have started to play the game named »Who will rise out of the bed faster, me or the sun?«. Usually it was me. Because that gave me a slight chance to grab the »grown man« camera and play with it before my wife catches me ;-)). However, this day sun won as it was already peeking from behind the hills when we came out of the room and to the balcony. 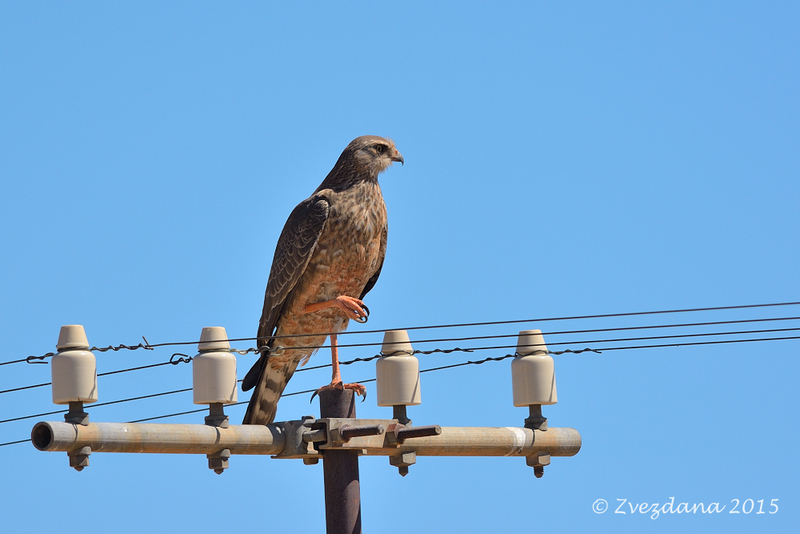 Before I continue, and dazzle you with my birding knowledge, a disclaimer: the birds ID's are courtesy of mfuwe, another fellow Tripadvisor member, and a great birder and also a man that loves Africa. If I was unable to put the proper tag to the proper bird, it is my mistake not his (OK, his hand writing could be a bit more readable ...). 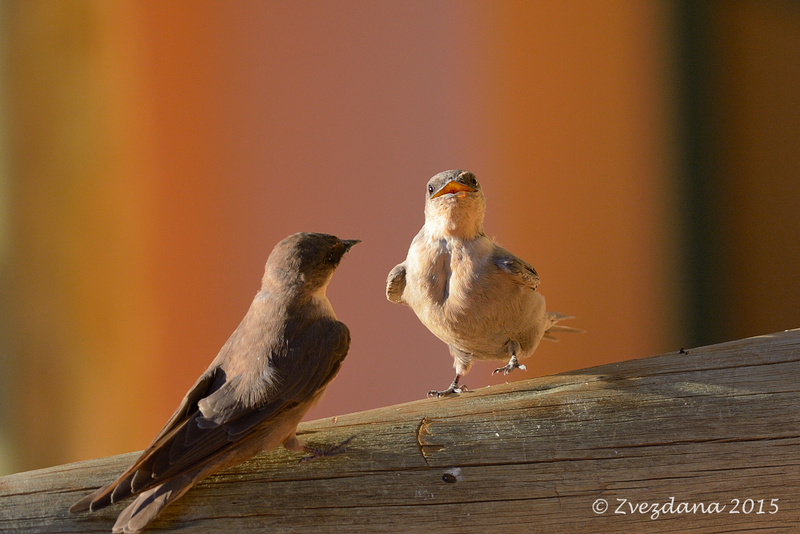 In the early morning light a couple or Rock Martin's, sitting on the balcony handrail were probably discussing what happened yesterday and what stories lies ahead of them. And same is what we did. Still part of the nature, are we, humans? Out of the room, we have strolled around the property for a while. 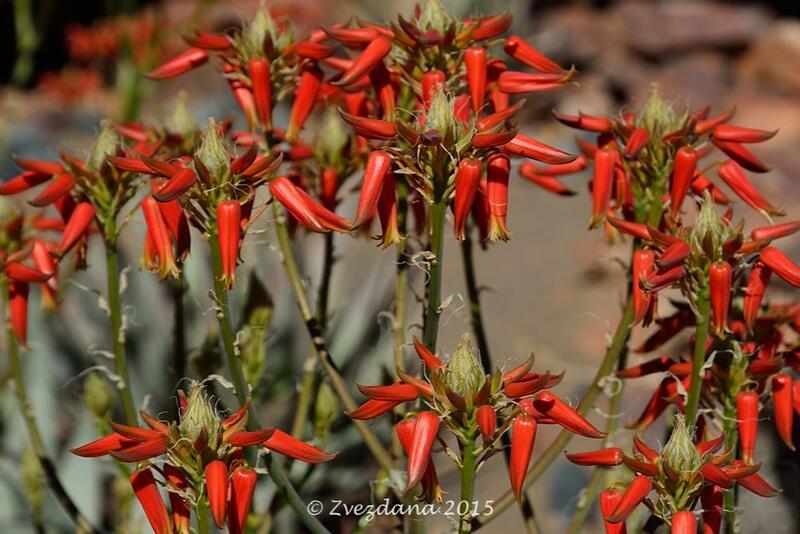 All kind of different plants, including strongly looking ones. 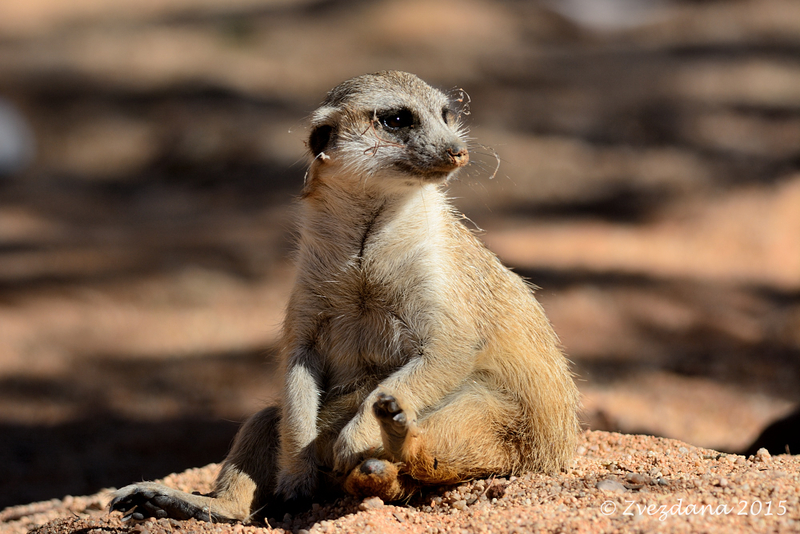 There lives a resident meerkat, who has been injured and is on rehabilitation course at BDR. Just a place that dr.Doolittle would prescribed. With guests, and hosts, and workers there is always plenty of laundry to be done, so the ladies were already working when we came to the main house. 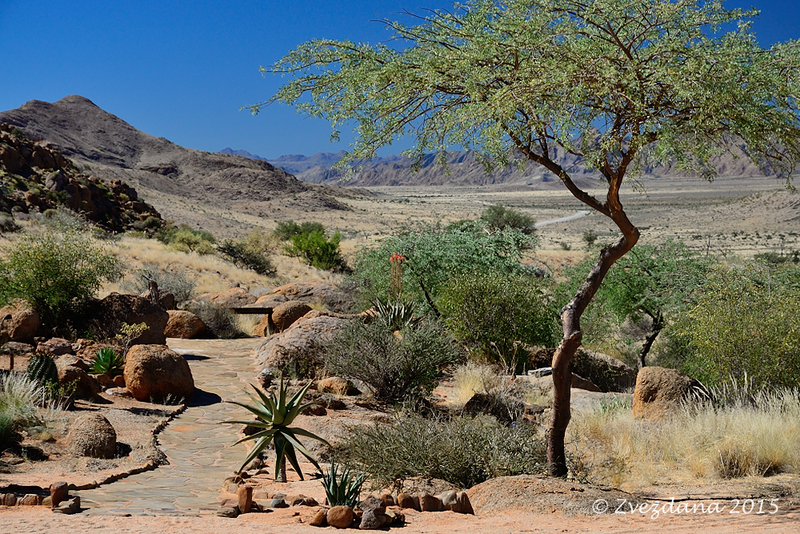 Then it was time for one of that great breakfasts, and coffee, and as we have no lust to hike up in the hills, we said Good bye to Hannetjie and Willem, and drove towards next stop. We reached C14 in 15 min, and next there it was: the most unusual tourist attraction one can imagine. 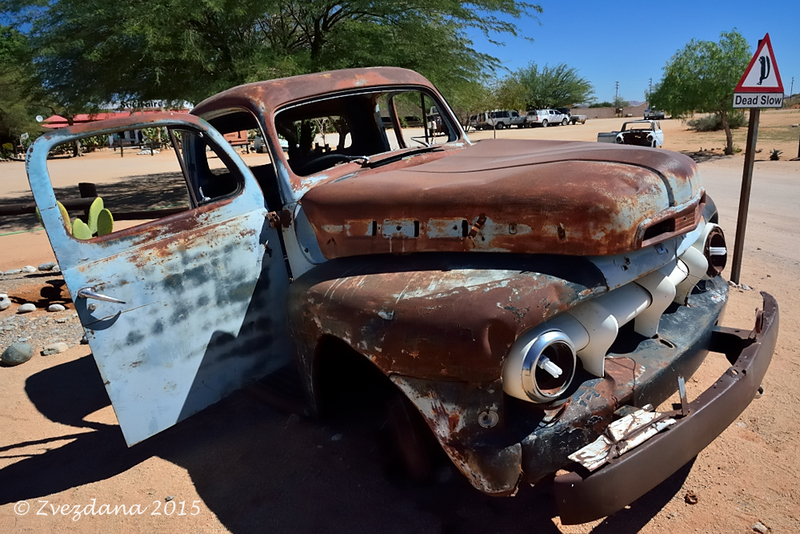 Built exclusively on few scraped old rusty chassis, and an apple pie. But what a pie!! 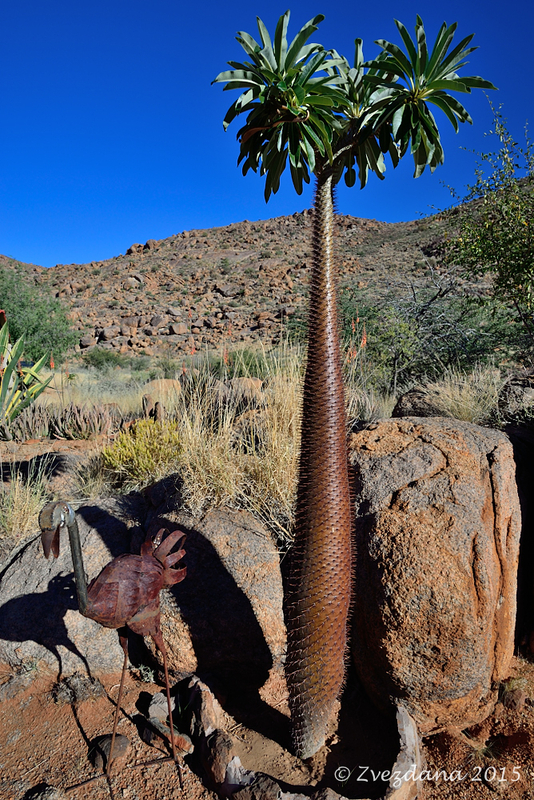 One to .... well, one that deserves a stop by anyone going to or from Sossusvlei. 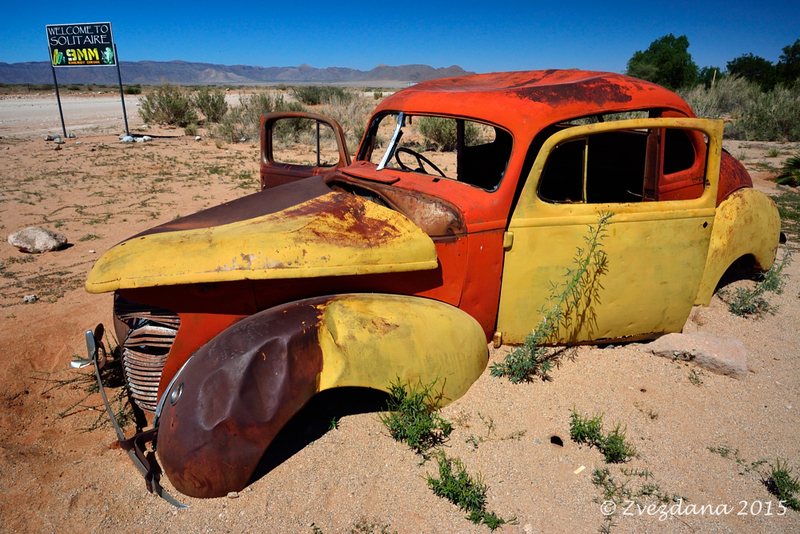 I think that the old cars have been photographed at least as many times as Dune 45, so we have added more to that acccount. 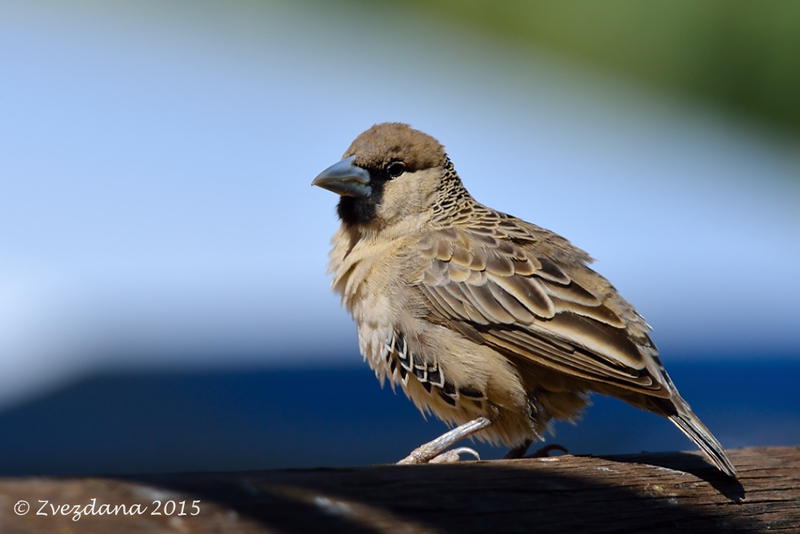 And trying to photograph some of the birds that were fighting for the crumbles of the apple pie. Sociable weavers were the most obliging ones. 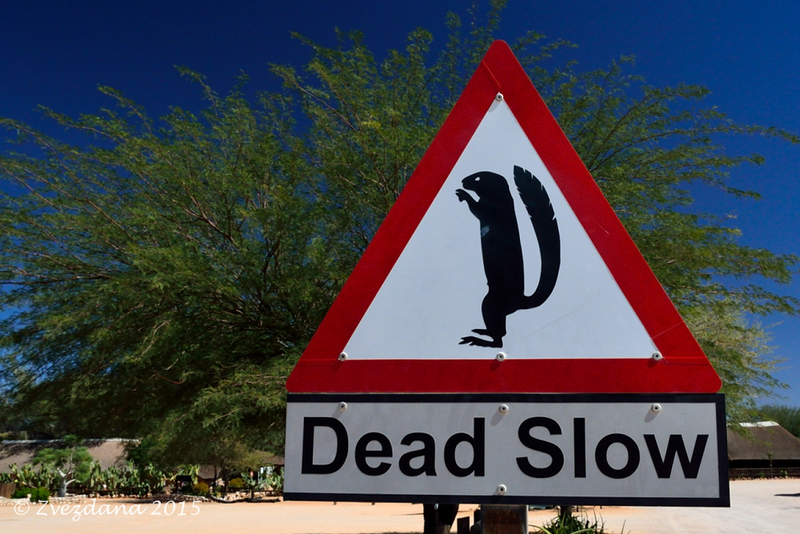 On the approach road, another road sign that can be found only in Namibia, was alerting the drivers that there are many ground squirrels around. When our lust for apple pie was satisfied we have continued the driving on C19 (or is it M36) towards Sesriem, passing by more lodges that offers solitude and views over vast expanses. 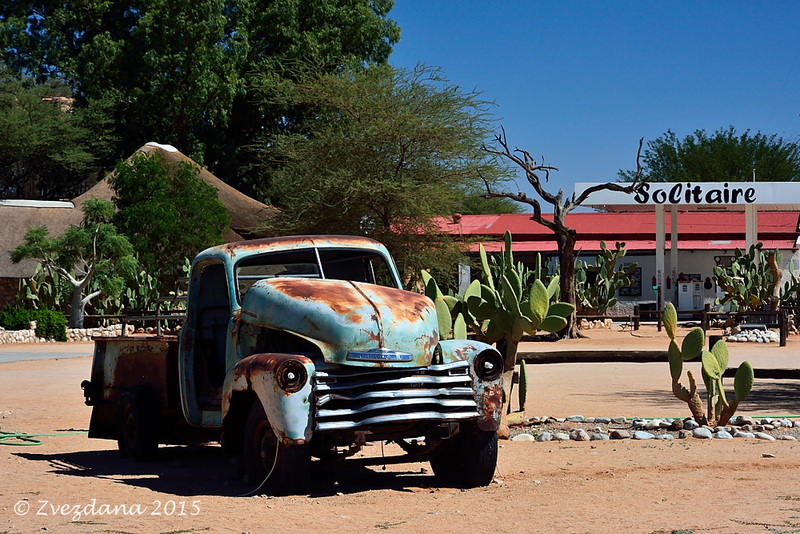 SDL is the lodge one wanted to stay if serious about photographing in Deadvlei. 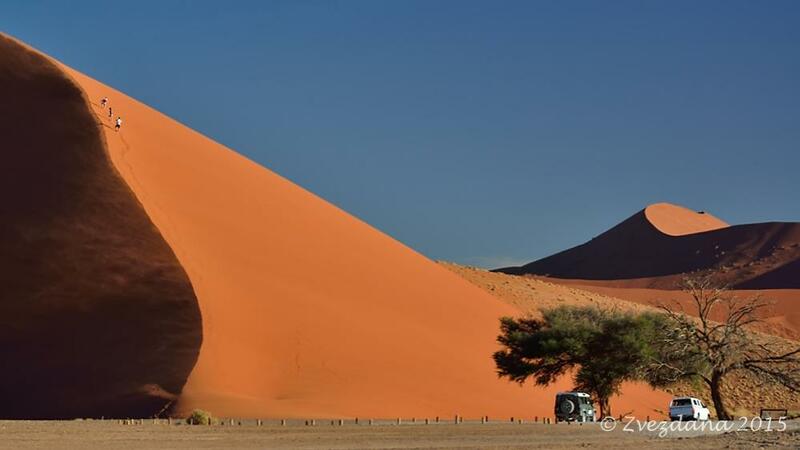 It is the only lodge inside the National Park and thus its guests can start driving towards Deadvlei much before sunrise, when the main gate to the park opens. It is run by the NWR, and this statal organization is notorious for its unresponsiveness to booking requests sent by email. If not for other benefits, to get a room at one of the NWR run lodges one need to use a locat travel agent, as we did. The main attraction of this lodge is its location i.e. 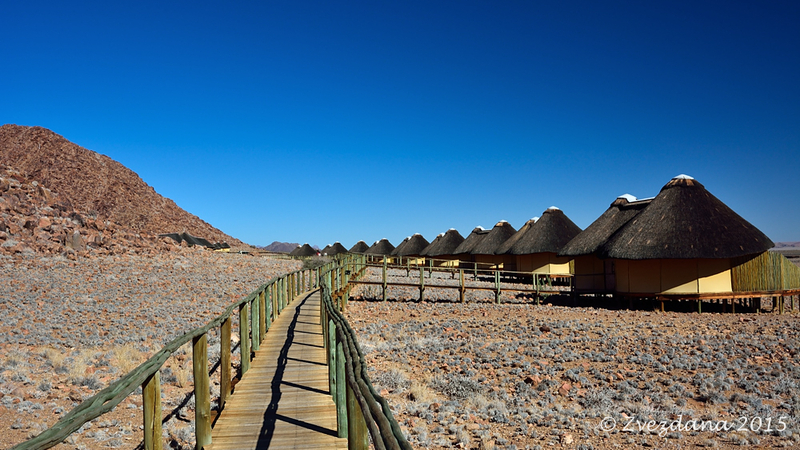 proximity to the Deadvlei and being »on the right side of the gate« and they surely charge for this benefits. So only one night was what we afford to ourselves. Thus the timing and the planning had to be very precise, to get as much out of the money invested as possible. 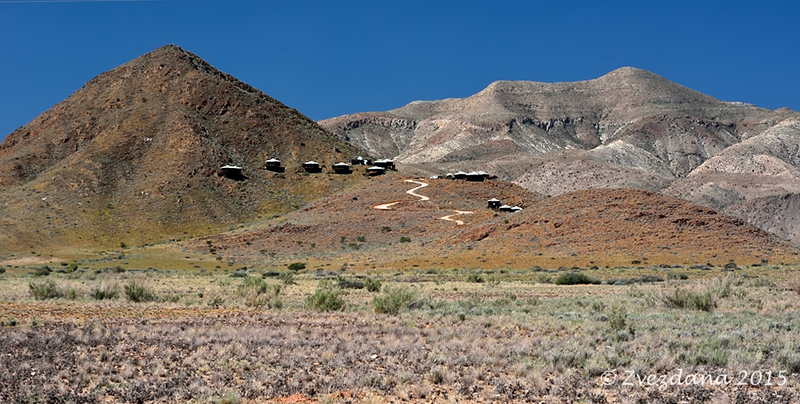 The SDL is built to one of regularly used concepts we have seen in Namibia; a long wooden rised walkway with single or double cabins on one side. The main area, with dinning and pool, in the centre. 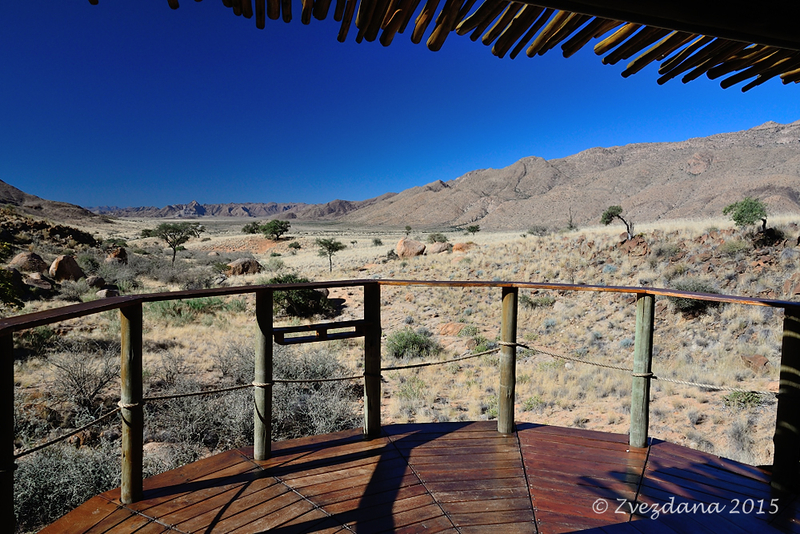 The view was, well, to be honest, just bleak, in comparison to the view from Grootberg Lodge. But that is personal opinion, others might differ. At least there were some plants to add some colours. 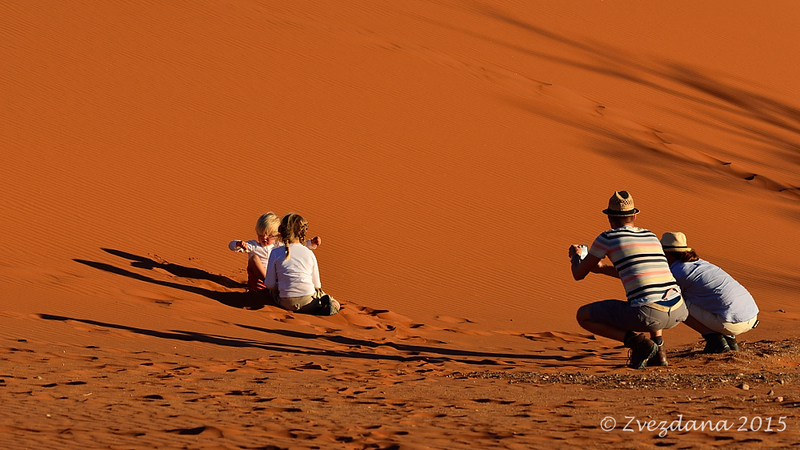 We were early arriving at the lodge around 3 pm so we have time to do some red dunes hunting. A short private road connects SDL with the main road, which is tarred all the way to the 4x2 parking lot. Driving speed is limited to 60 km/h, and at the time of our drive, only 2-3 cars were on the road. 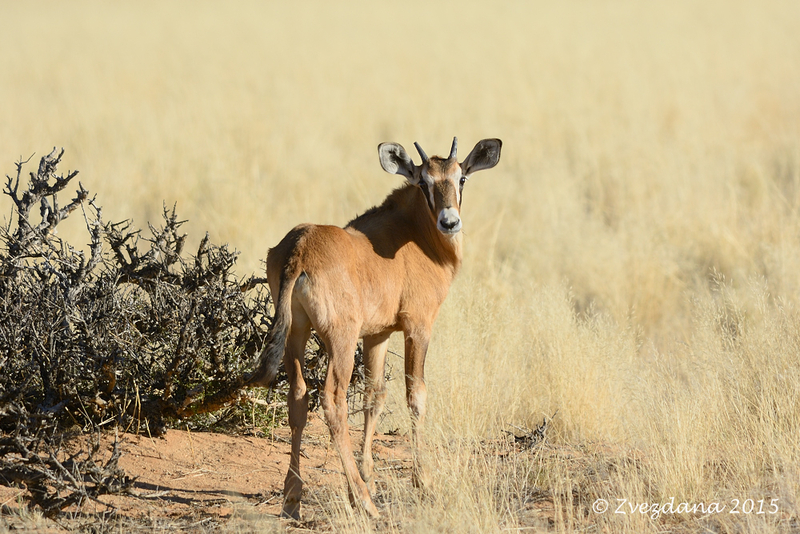 We passed by some usual suspects, like gemsboks and springboks. 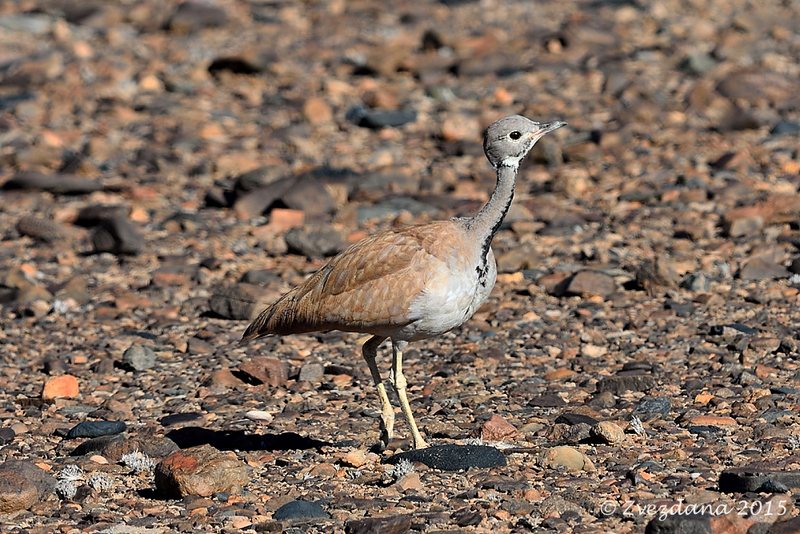 And by some less usual suspects, like Ruppell's Korhaan. 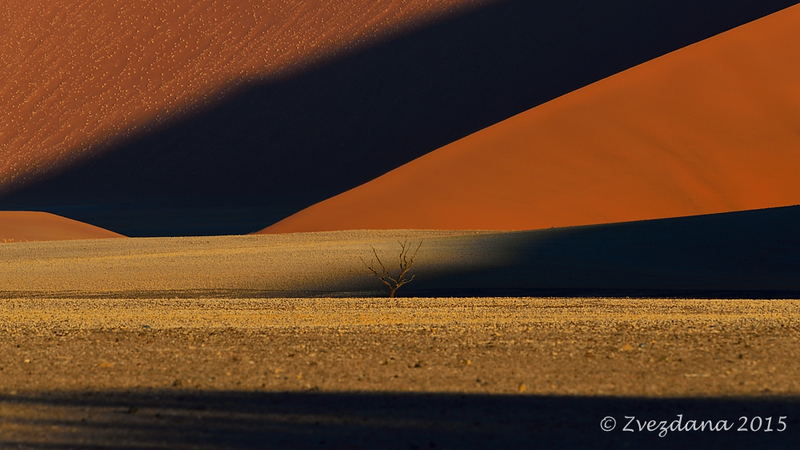 After entering the »Great Piles of Sand« area, photo opportunities were left and right; mostly right as the sun sets down on the right if driving towards Deadvlei. 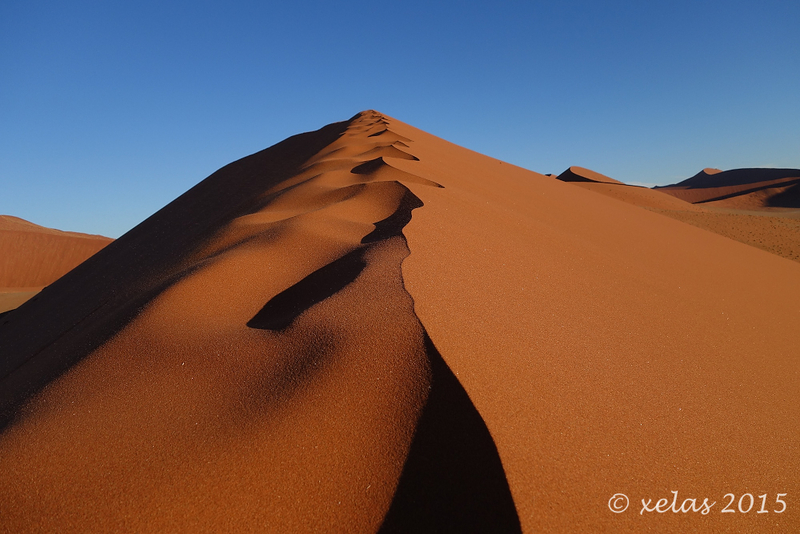 The most visited dune is at KM 45,, thus its name: Dune 45. 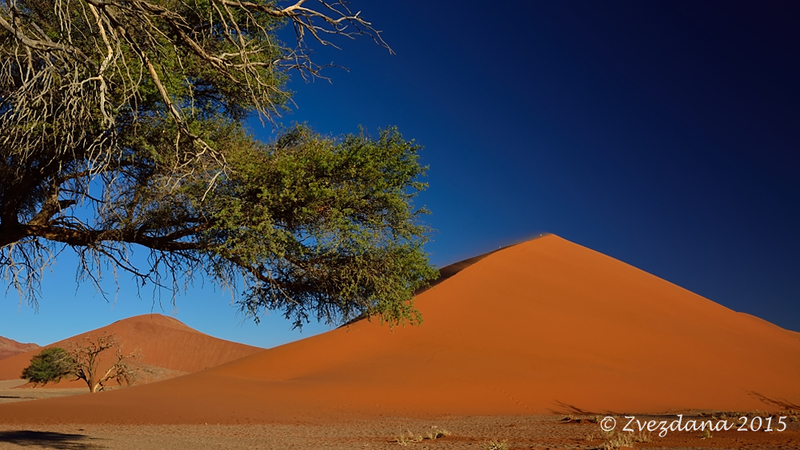 As overphotographed as the Deadvlei itself. But with a good (i.e. photogenic) reason. There were a couple of cars there when we arrived. The most interesting for me was how the sand changes its colour, from almost pale beige to dark flame red, depending on the position of the sun and on the angle of the view. Not only wide angle lense but also telephoto lense can be a great landscape lens. 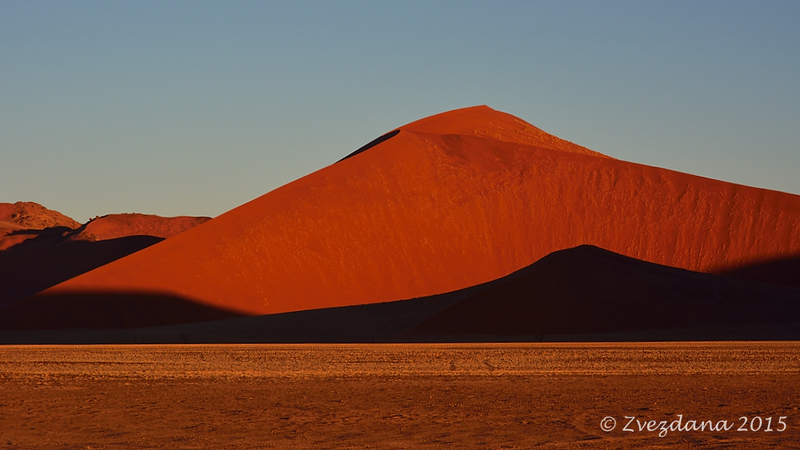 The sun was almost touching the dunes (at 5.30 pm) when we said goodbye to Dune 45. And yes, we have been succesful on our first hunt for the red dune. Looking at other people's landscape photos I sometimes cannot believe that the colours of the photo I am watching are true to what the nature produces. This one might be one of those »not too natural« colours ... if not taken by Zvezda. The African light ... such pleasure. We returned to the lodge when it was already pitch black. To help me find the turn on the private road I have resetted the odometer when turning on the main road (thanks again, Supratik) thus it was easy to get on the right track, and also the lodge was visible in the distance. Dinner was OK, but just OK in comparison to the one we have had the night before. 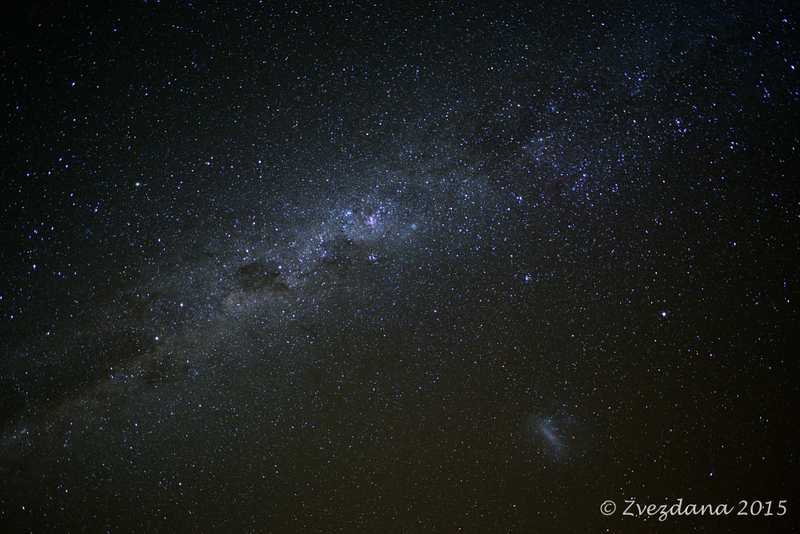 As it was still moonless time, more night sky photos were made. I have been waiting eagerly for this TR for months now, and then I go and miss two whole days! Inexcuseable. Thank you Alex and Zvezdana, your TR's are always works of art!